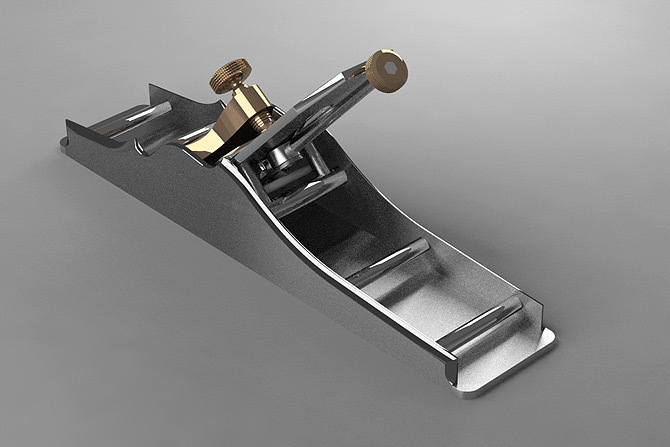 There has been much discussion about the brass pads on my blade bed but the logic is quite simple. The blade is supported only where it counts i.e. 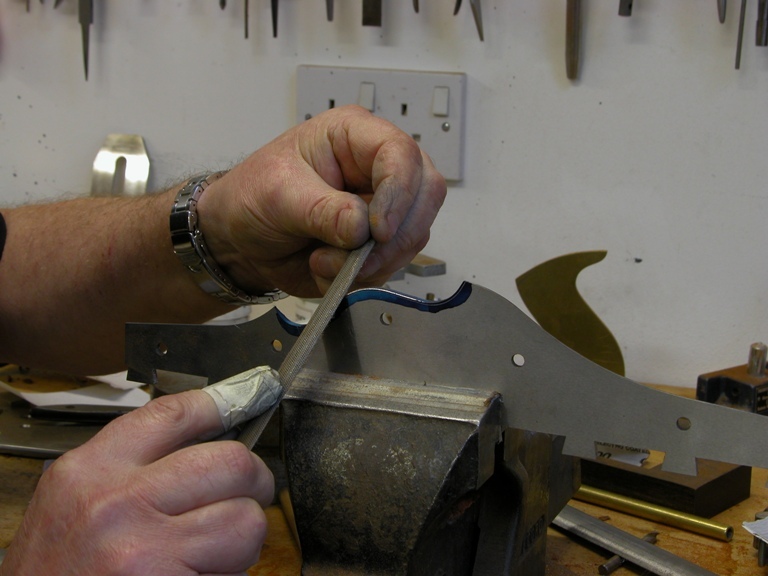 along the bottom edge directly on the frog and at the rear where I have inserted the brass pads. Theoretically the three legged stool principle would be ideal. 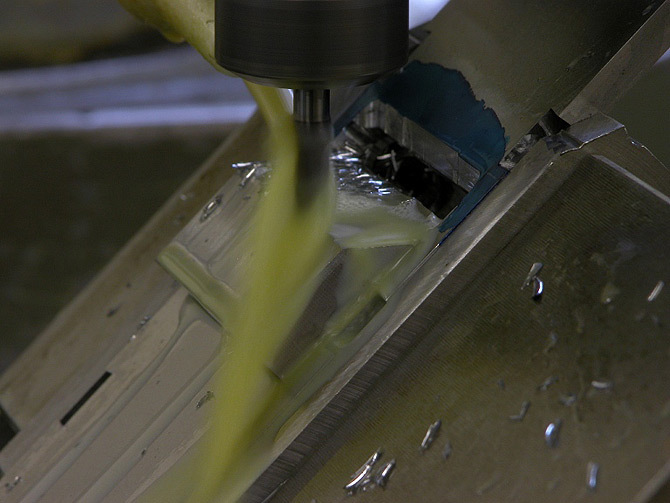 The idea of bedding a plane blade over the entire surface would only be possible if you were using some sort of bedding compound. 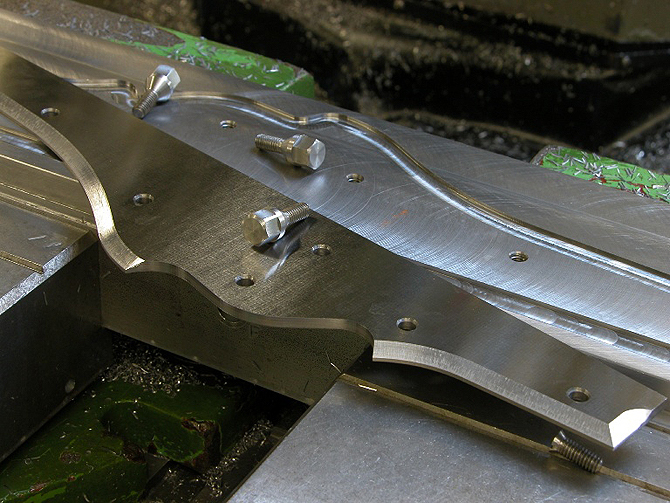 But it is pointless anyway especially with a blade thickness of 3/16ths”. 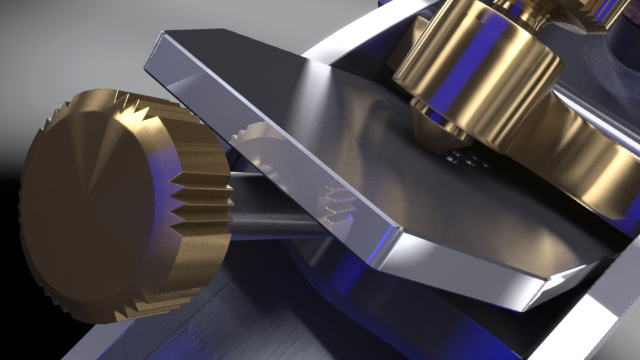 There is no way I want the blade touching the bed in the centre as I might be relieving some of the pressure at the front end where it counts and I could get a see-saw effect. This is eliminated by raising the contact points a small amount. There is also less chance of the blade coming to rest on any debris. This picture of my A1 14 1/2″ dovetail infill plane shows the points I have just mentioned but with the brass pads waiting to be trimmed to level. 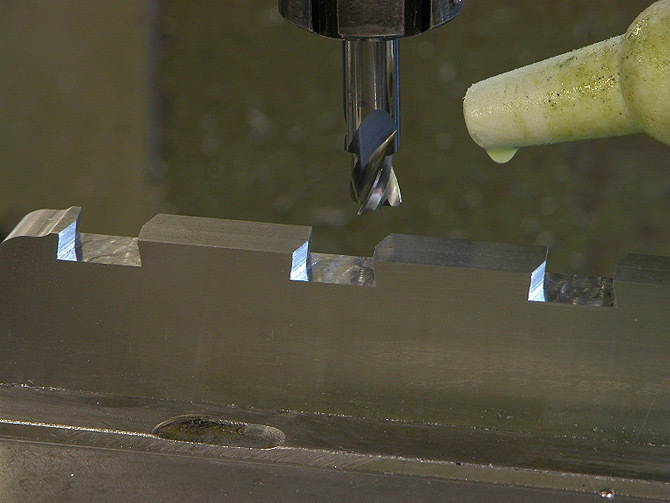 To do this the whole plane body needs to be held so that the blade bed is truly level. Hence the DTI to confirm this. 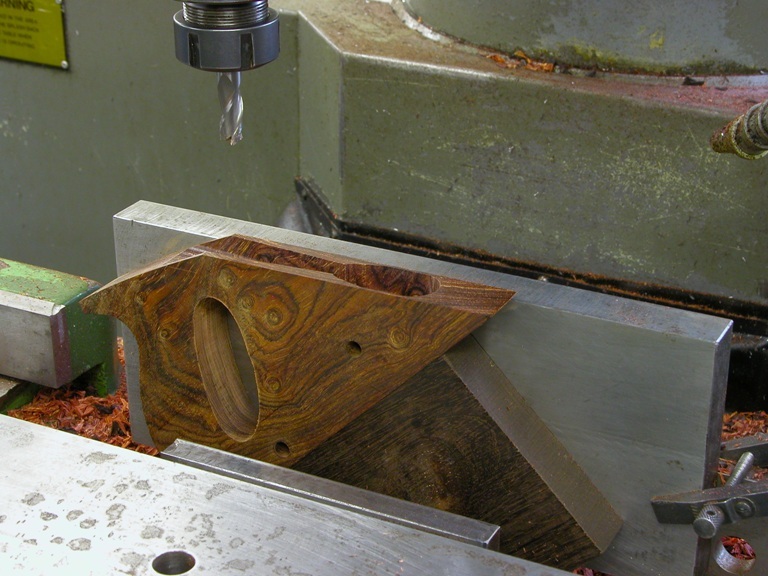 Once the angle of the plane body – 50 deg in this case – has been adjusted so that the plane on the frog is level and checked with the DTI, then I only need to touch on to the frog with the cutting tool and zero and that will be my cutting line for the pads. This gives me a true plane for my blade. 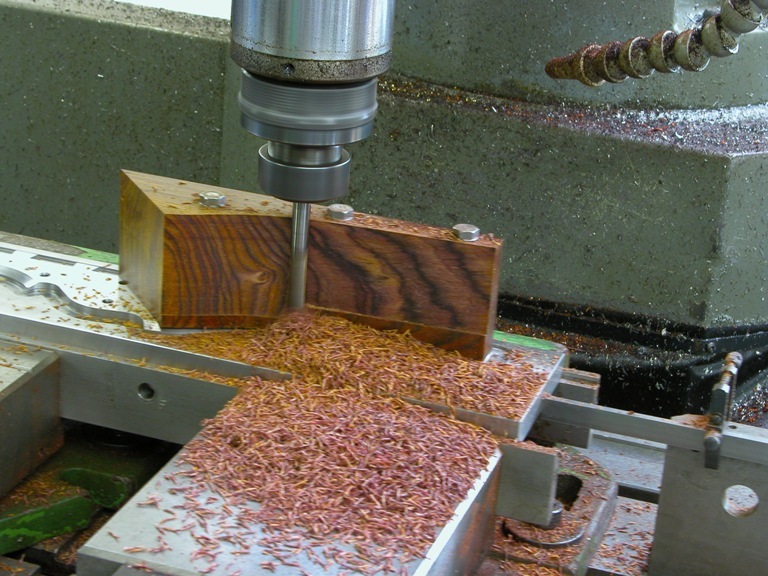 There will be no stress to the blade or plane body after clamping from the lever cap. The cupids bow section needs a slight camber similar to that of a carriage roof. This needs to be done by hand. Note that the edge forming should be blended where it contacts the rear of the front bun. Final closing on my A1 dovetail smoothing plane. As with all my infills the work is roughed out between 3-6 months before use. Completion of moulding. 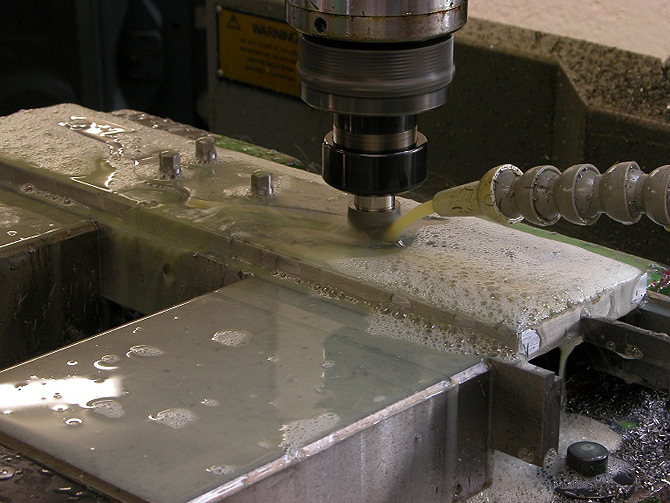 I prefer to do this method on a milling machine using tools I have made myself. 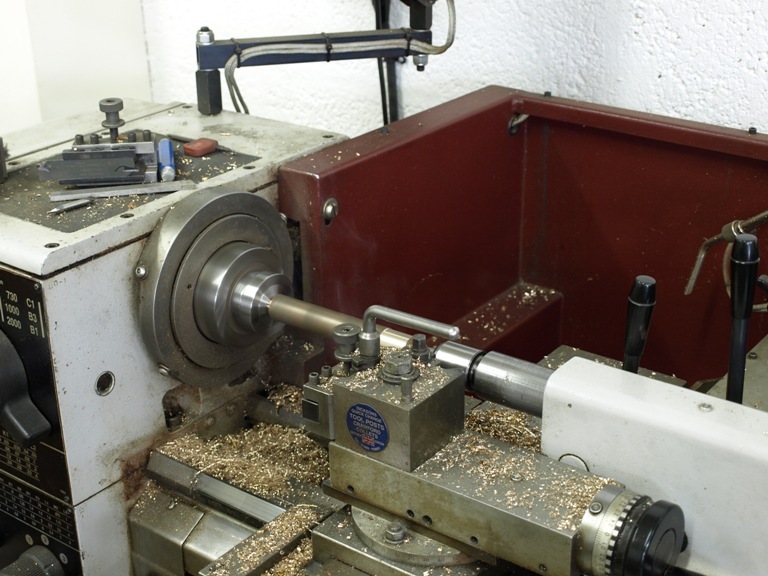 The advantages of the mill are that everything is true and dead centre. All my machines are equipped with DROs. Part of the cupids bow contour which runs into the front bun. 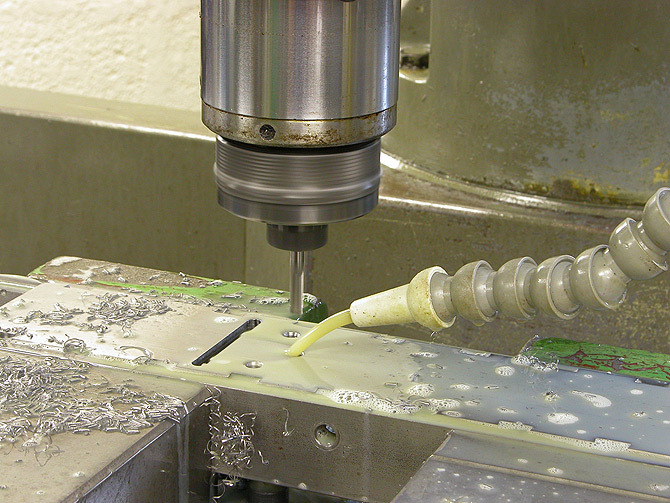 Picking up the side contours whilst the work holding tool is still in place. It may seem over the top but if I can work the contours to the exact size and shape plus 5 thou then when it comes to fitting and flushing I won’t lose any of the shape and sharpness of the sides. Its these little things that suddenly become a lot more important in the grand scale of things. Yes, hand work! Now my secret is out. The final polishing even though it is only part of the bun. As you will notice everything has to be done in an exact sequence so that you can have that sharpness which so many people miss. Final fitting of the front bun so once its assembled for the last time there will be little spoiling on the final flushing and polishing. 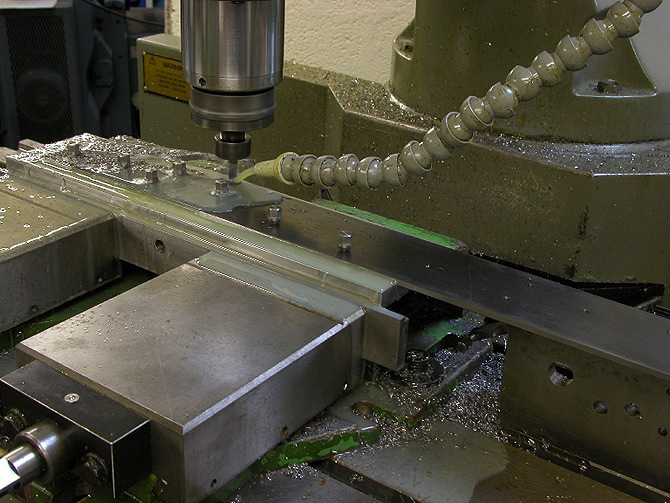 Machining the adjuster recess in an A1 handle. 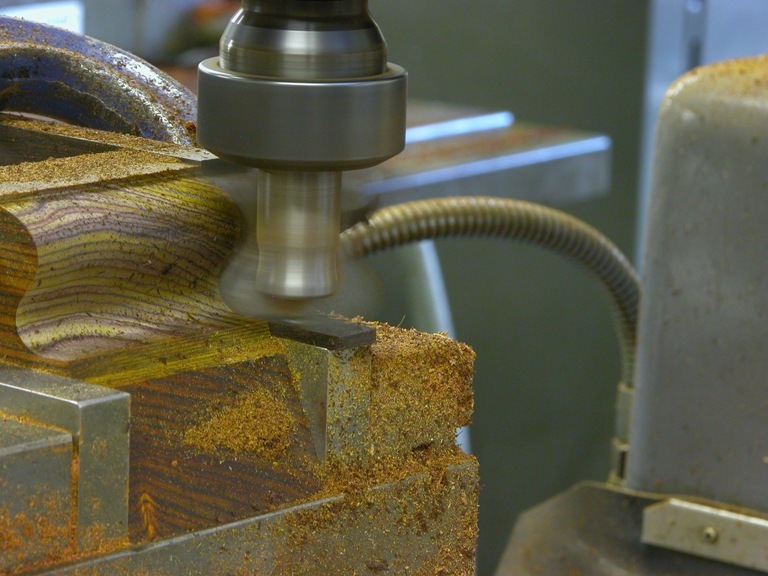 The cnc mill is just the perfect tool for this; too much hand work in this area could leave a finish as though it had been chewed out by a rat. I am not criticising those doing this kind of work with hand tools but they would be hard pressed to match this quality. It can take a long time in the setting up but once up and running the whole recess will take less than 5 minutes to cut out, using only two tools. Removing handle after recessing. Thought this picture would make things a bit clearer, with one of the clamping plates removed. 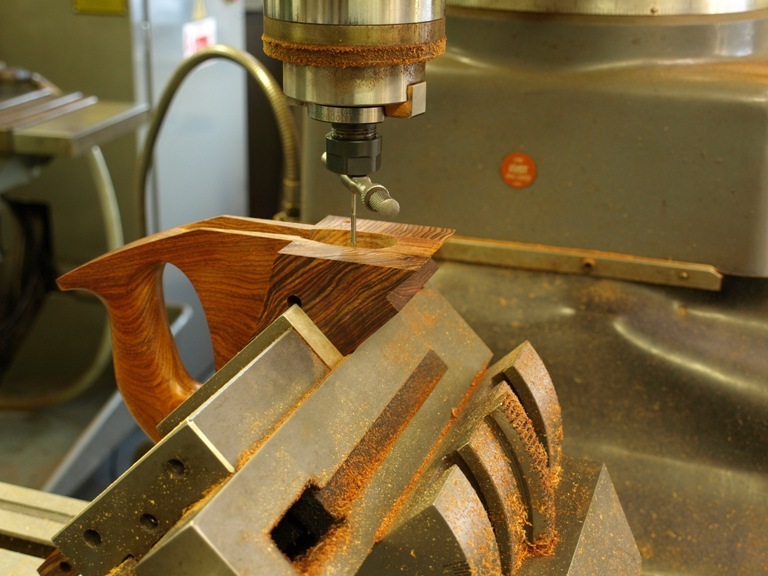 Each handle is individually centred as it is very difficult to apply any uniformity when working in wood. Showing finishing handle after a considerable leap (I seemed to have mislaid some pictures). Still a long way to go even with the metal work complete. Centre finding for adjuster fixing. 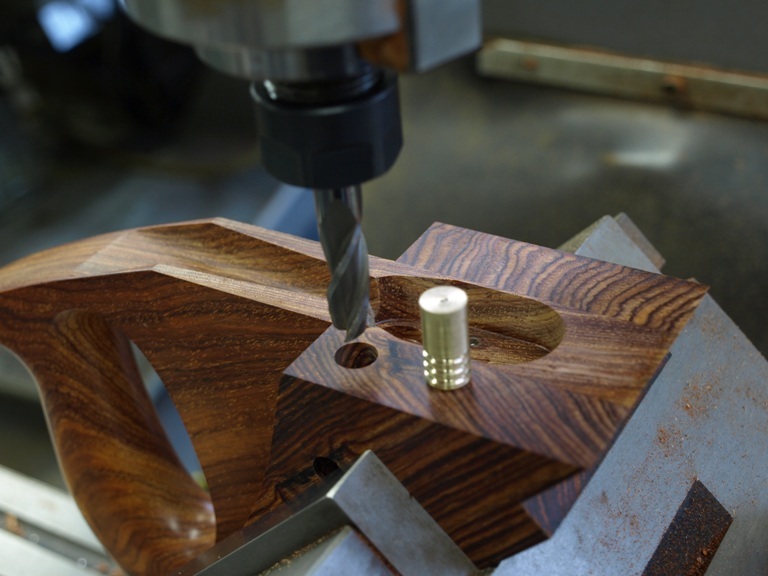 Hand tapping after drilling the concealed brass dowel for adjuster fixing. This is boring the hole for one of the two brass pads shown (some people think that these are just recessed pads when in fact they connect with the metal spacers). More discussion on this later. 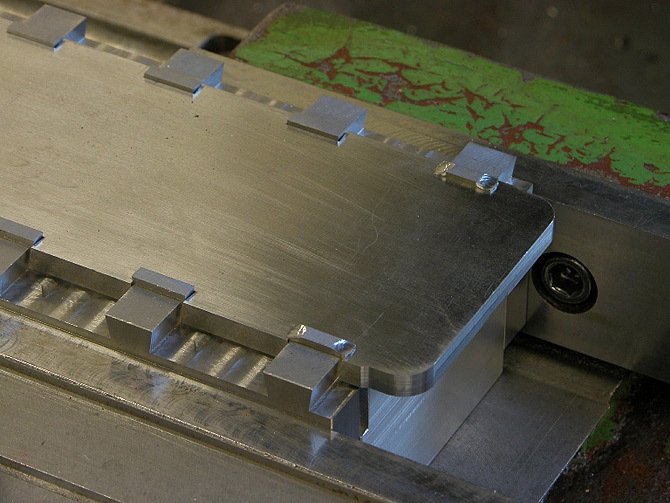 After grinding and drilling the sides they are then screwed to a holding jig via jig screws for profiling. Roughing out the shape on the A1 14.5 sides. A1 4.5 after chamfering. 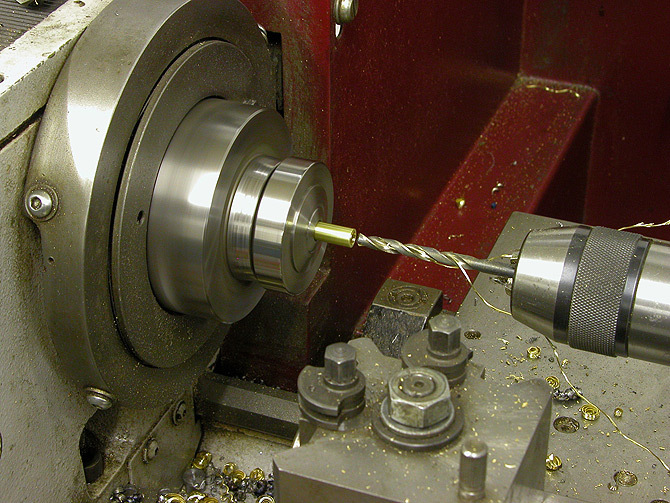 The picture showing chamfering complete and removed from its holding jig. 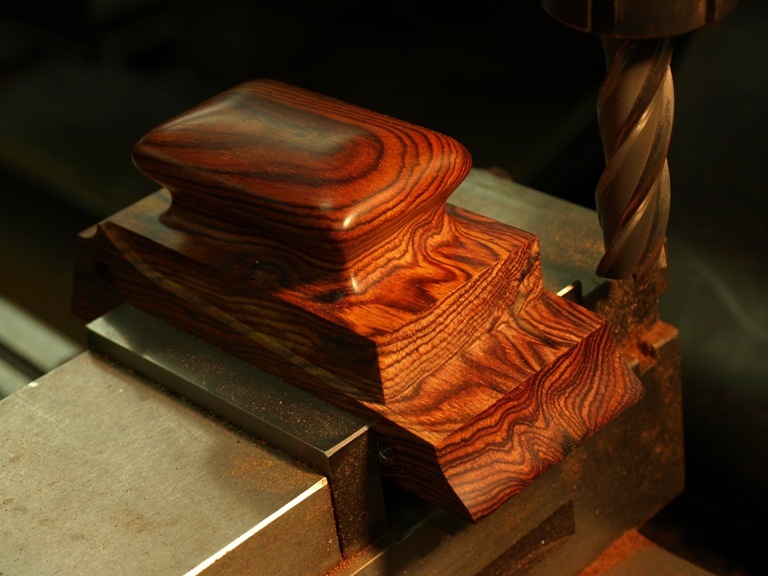 Even with all the time saved from not having to manually file there is still the polishing. 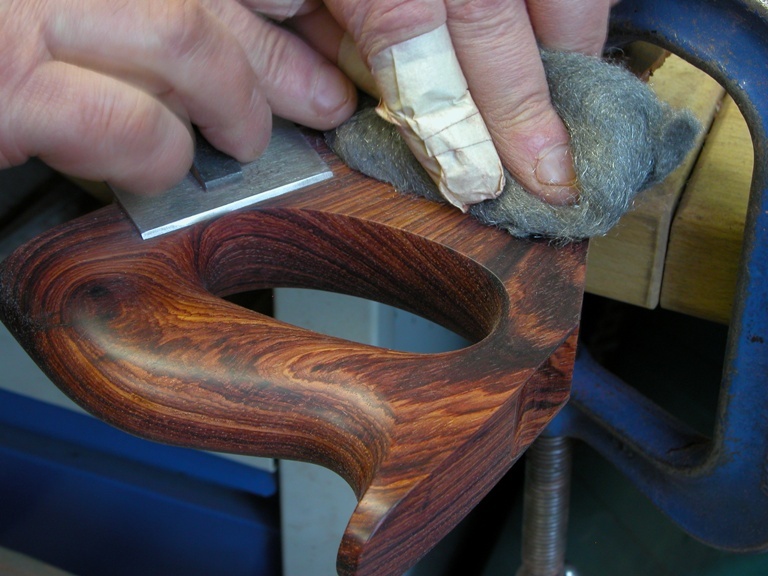 This has to be done by hand with a great deal of care otherwise all the finish and precision can be lost. 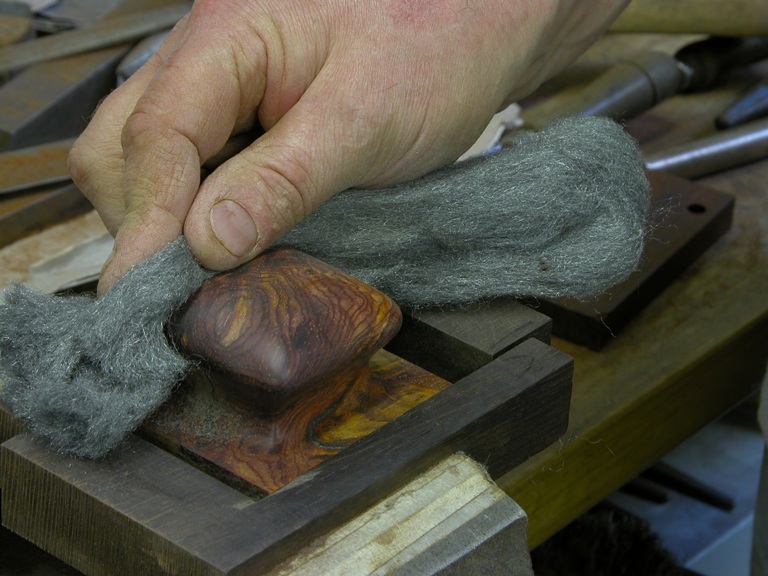 But the dovetailing needs to be done first. A1 after the dovetailing. 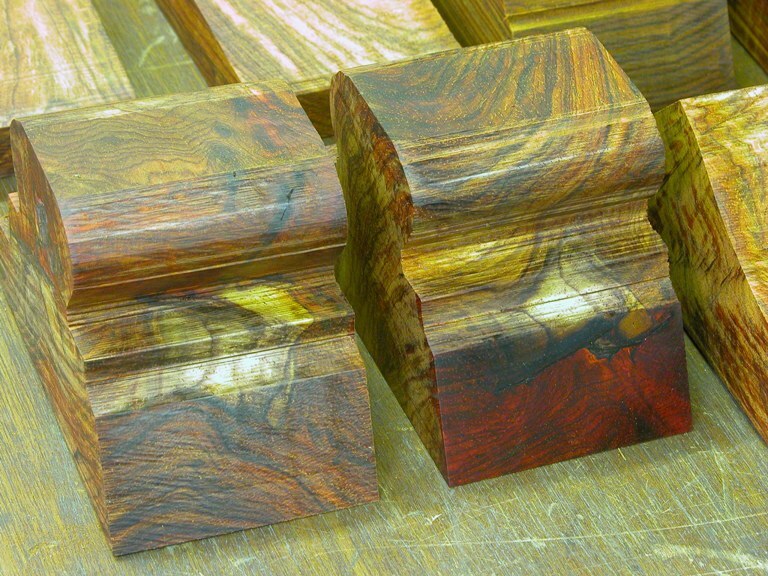 Picture showing dovetails after completion. In this situation there are only 4 sides but I would do up to 12. Cutting the dovetails on the bottoms. 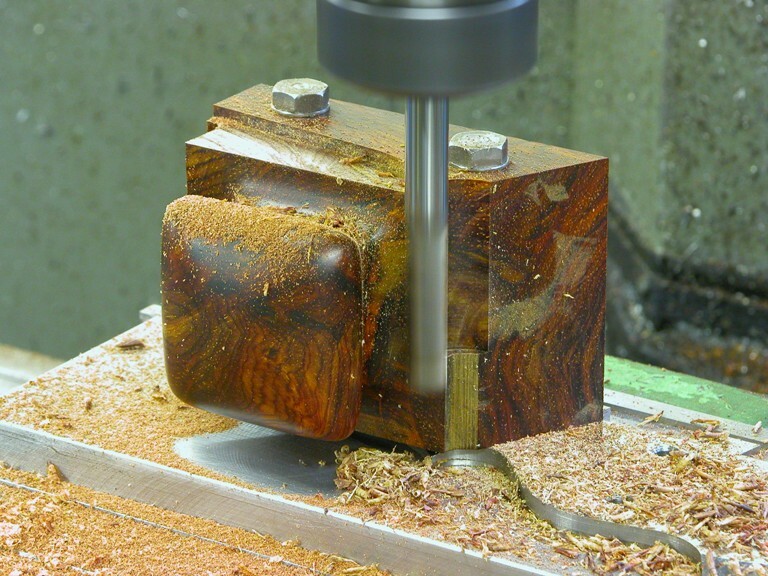 These are usually done in pairs only as they need to be back to back to produce a compound dovetail. Saves a hell of a lot of filing. A1 14.5 drilling and breaking through for mouth. 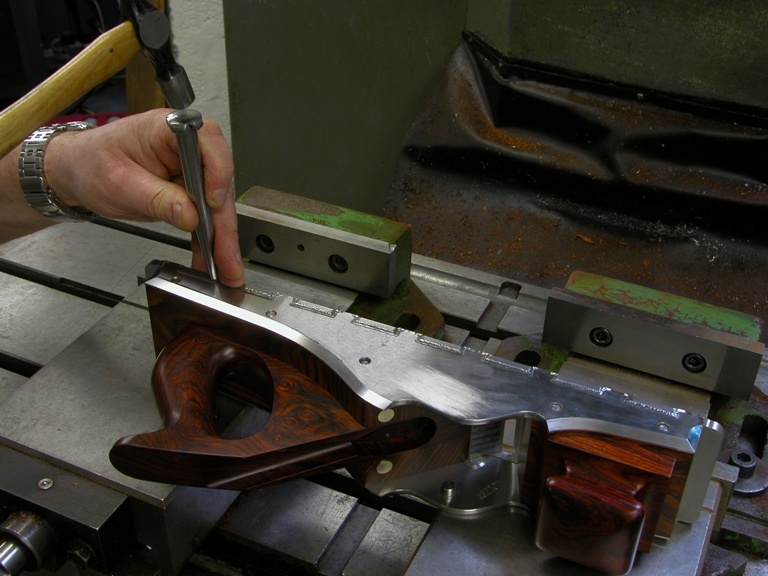 Showing the bottom after the dovetailing, slotting for mouth and drilling holes for the frog riveting. 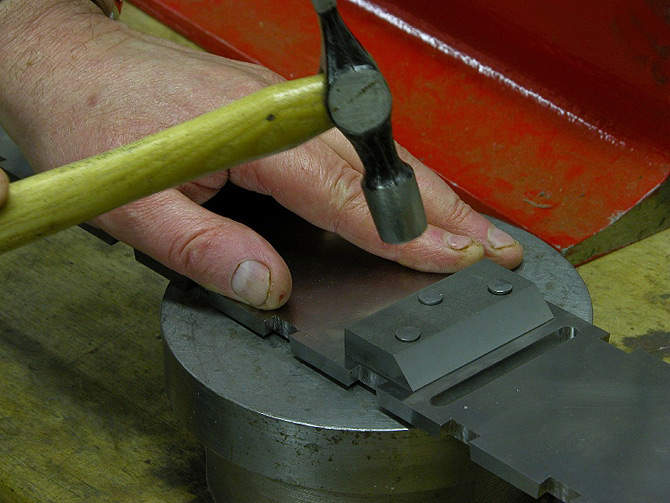 A14.5 frog riveting – a boring task; one of many of the riveting operations which I hate. The frog is one I prepared earlier. 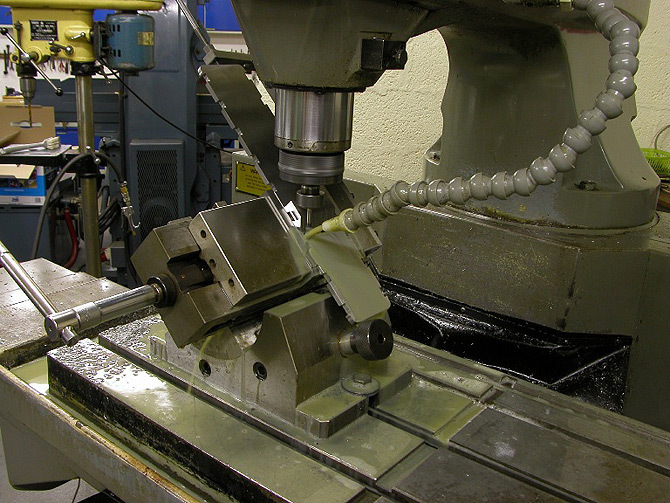 Milling operation to the mouth after the frog has been riveted in position. Easy isn’t it? Second part of the mouth forming. Mouth almost complete but will need tuning at the final stages. Once all the work on the sides and bottom is complete one of these is very useful to have. This is the tool I use for closing up i.e. 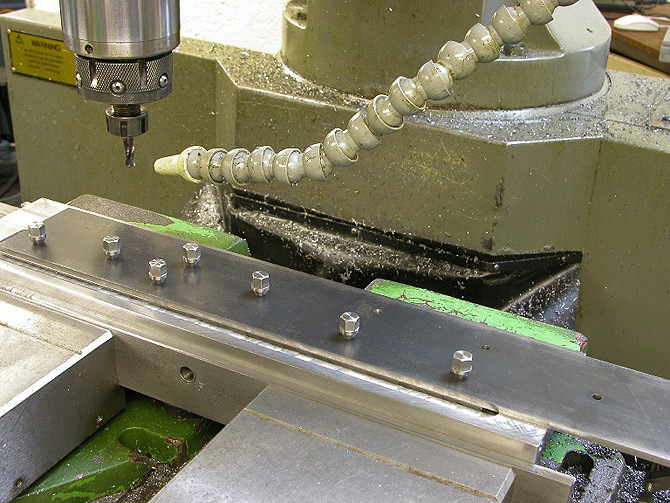 joining bottoms to sides The inner former is precisionally machined from aluminium and also the two clamping plates are precisionally ground. 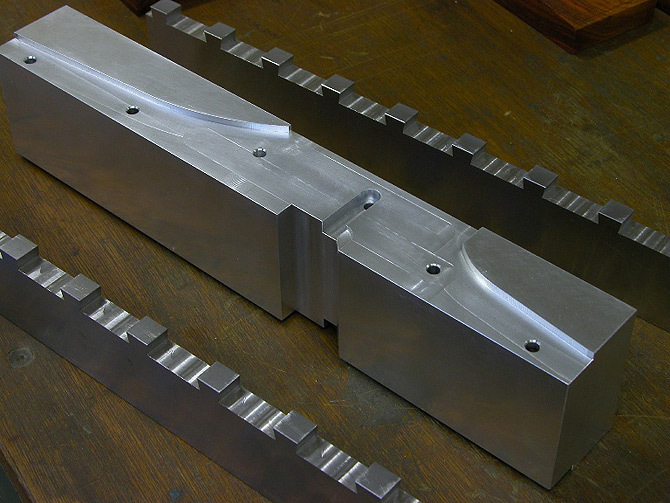 This picture is showing the plane assembled around its former with the dovetailed clamping plates applying pressure from a pair of milling vices, not just on the sides but also on the dovetails. 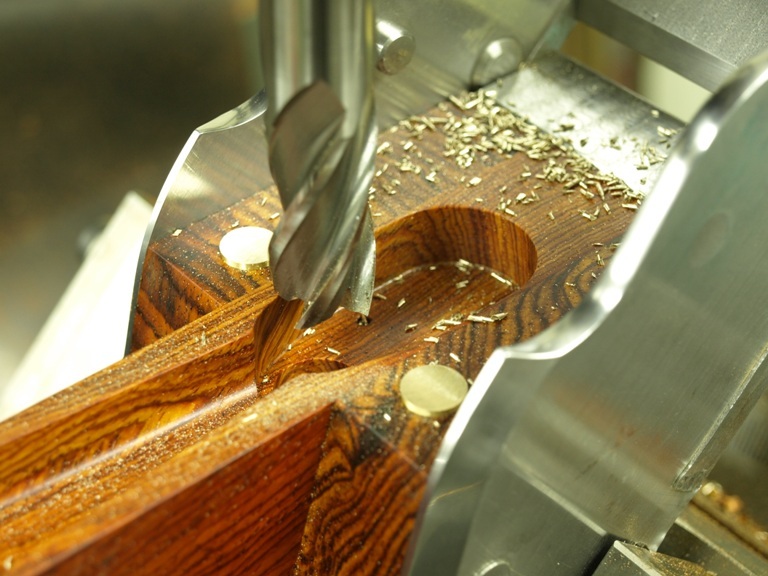 The dovetails would have a tendency to spread pushing the sides of the plane wider apart. This means that I would start to lose the internal dimensions. This process of closing up is extremely critical as things will run out of true if they are not secured well enough. This can result in oversized and twisted plane body, There is a lot of evidence of this happening in some of the original infill planes that I have seen. 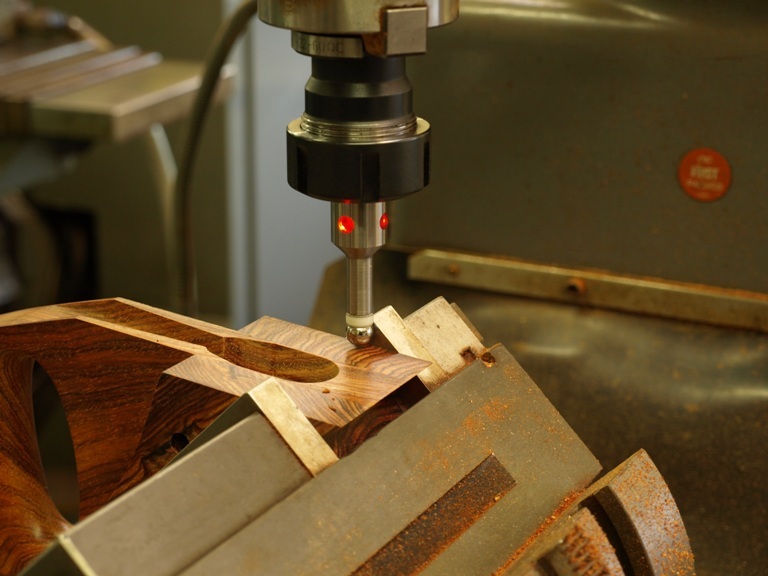 This means that you will notice that these planes usually show no uniformity in thickness to the sides and bottoms. 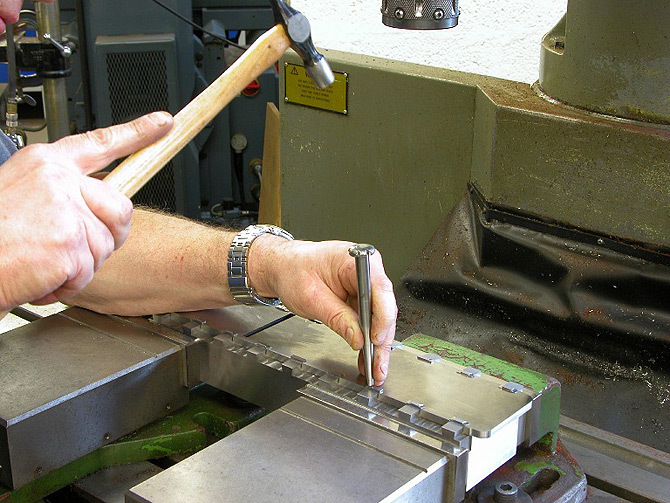 As you can see I use a very light hammer and a punch for the closing up, which means that I can make the metal flow in whatever direction I want. The light hammer blows do not transmit too much stress into other areas. 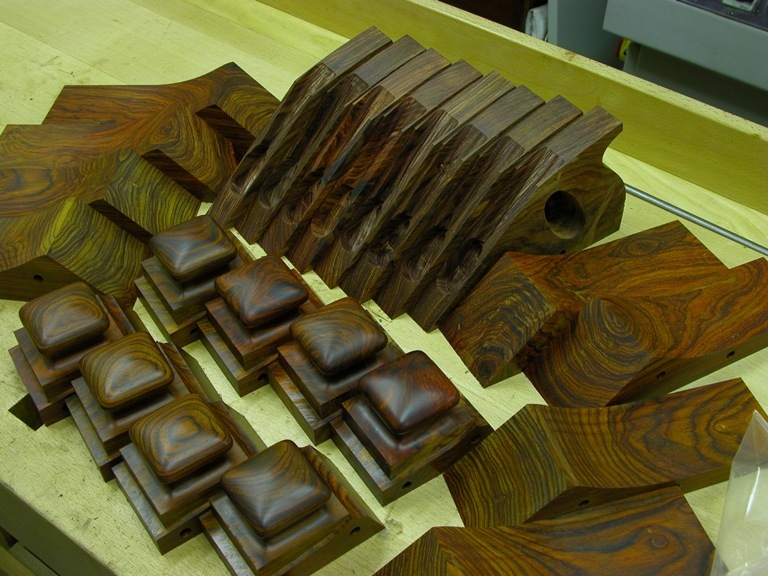 In the beginning when I set about making my first dovetail infill plane there wasn’t a lot to go on. There certainly wasn’t a text book on plane making. 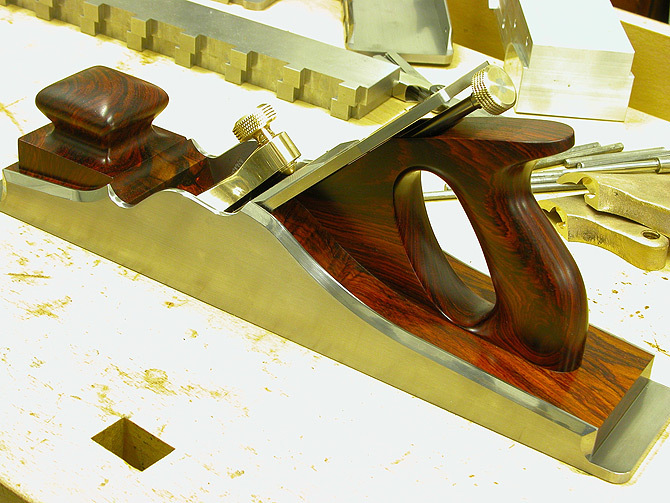 The A1 14 ½” Norris smoothing plane is what first drew my attention to plane making. The first plane I made was a 15 ½” panel. 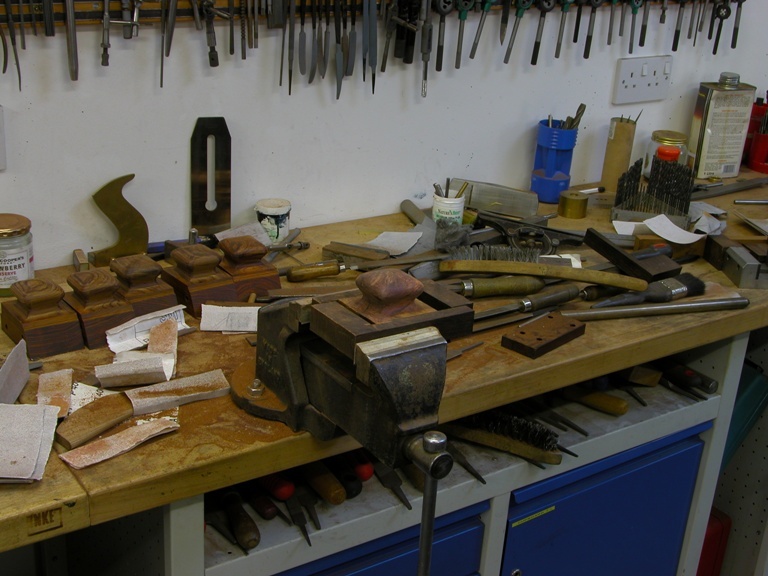 Having decided I wanted to build Norris type planes I spent 3 years researching these tools and I have come to know many collectors and found them extremely helpful. I also had the opportunity to examine these planes closely and have been involved in a lot of restoration. In the time of my working with these planes I didn’t find a single plane that could match up to its reputation. Basically the quality and work standard to put it bluntly was quite appalling with the exception of one, which I saw a nice picture of, a 17 ½” A1 was just enough to inspire me to take the project up. It would seem that in the heyday of the infill plane that the people building these dovetailed infill planes were working under a considerable amount of economic pressure with poor tooling and equipment. Probably in conditions similar to a sweat shop. My aim is not to discredit these people but to take this product and build it to the very highest standards possible. 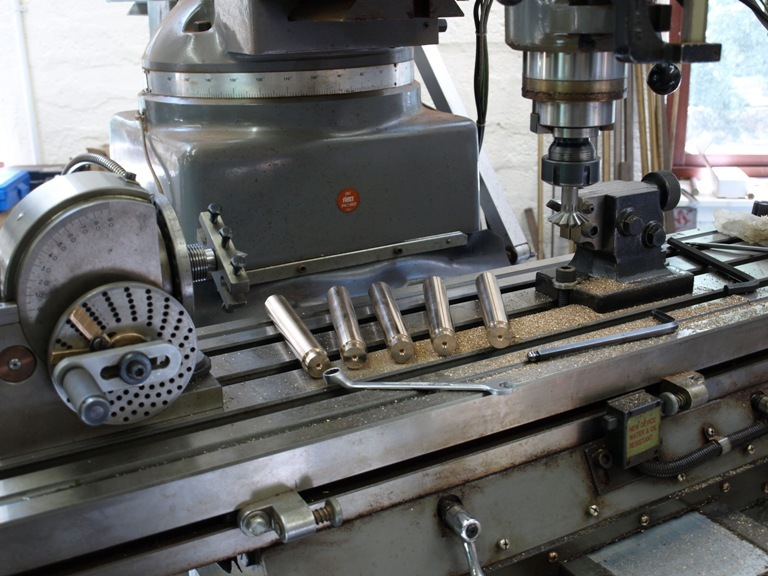 Without any financial constraints, over the years I have developed my workshop with a number of machine tools which could probably receive criticisms based on ignorance, as my aim is purely for precision and perfection which these machines play a great part in. I hate to disappoint those people who think I can set a dial and the planes fall out the other end of the machine in the style of Heath Robinson. 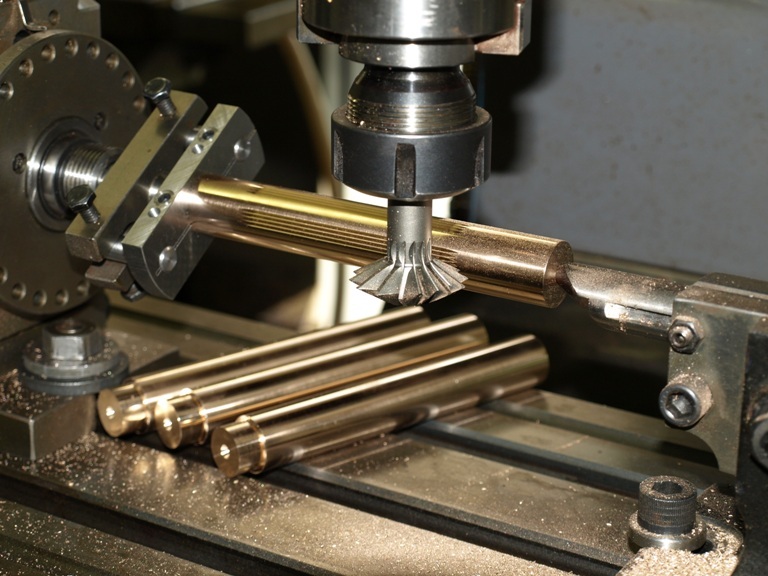 Although the machining is very simple when it is running, the hard part is getting there. All this invisible work becomes part of the void in people’s thinking and leads to lack of understanding. 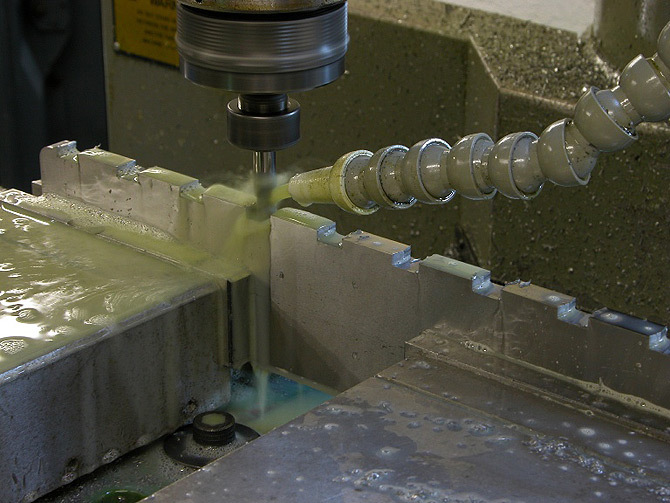 Then when the machining is done the other work starts – this can mean hours of carving, filing and polishing. When it comes to flattening it is a story of its own. Most of the following pictures will be based on a A1 14 ½” plane, I may use pictures from other planes where I need extra examples. (e.g. grinding picture is of No 982 bottoms). This picture shows the bottoms being surface ground to give me a starting point. 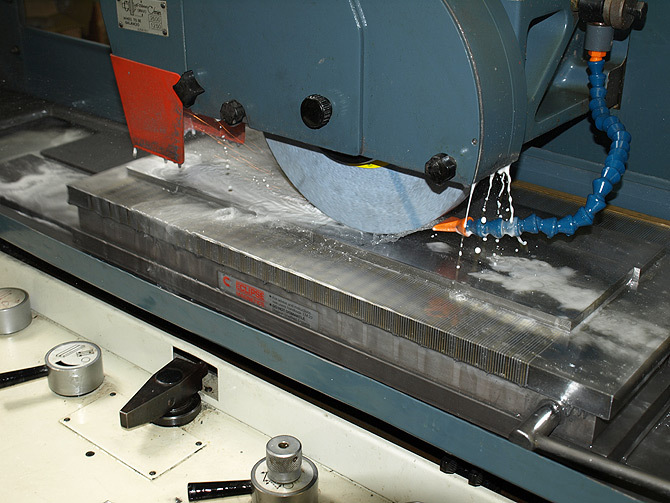 The material that I am using is hot rolled mild steel and comes in either bar or sheet form. 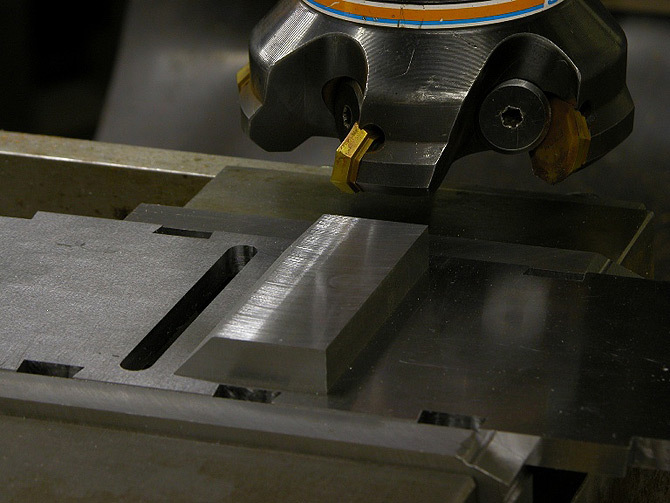 It is ductile and has no stresses so this material can be worked easily without fear of movement. 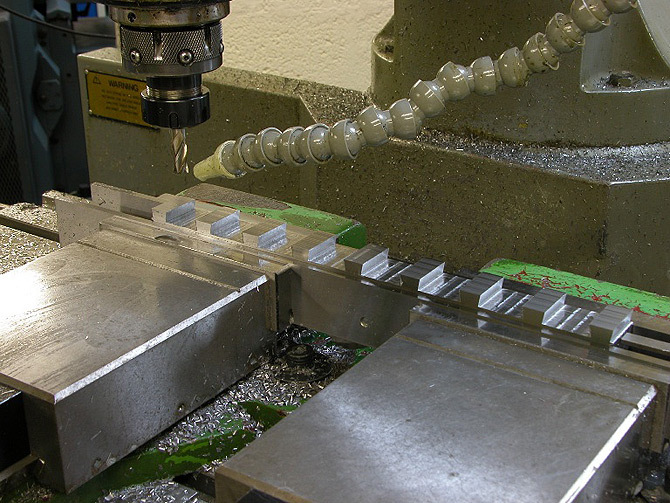 The infill plane seems to be more of a sculpture than a technical innovation and which is coveted for reasons of vanity. I have tried in my designs to deal with some of the weaker points. 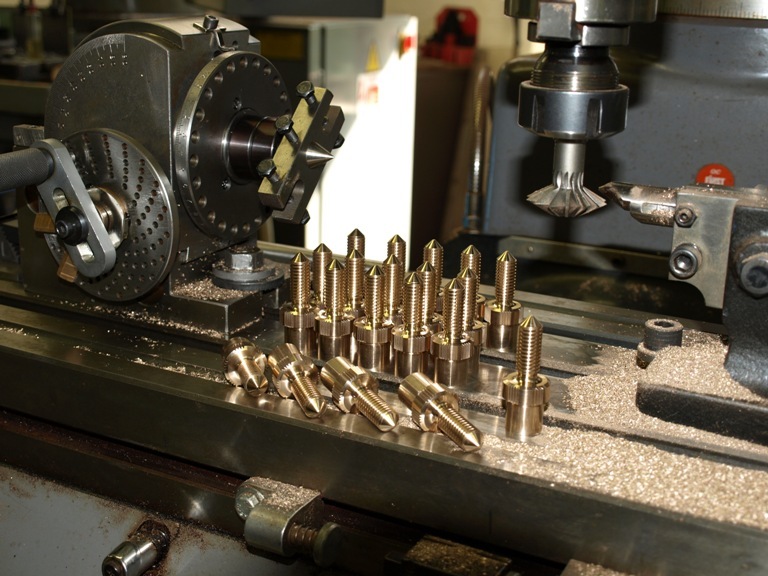 Brass spacer being drilled for the 7/32” mild steel rivet. The original infill planes never used metal spacers and just riveted straight through the sides of the wood. It would seem that modern makers are also avoiding the use of spacers. I personally put a lot of store in the use of these spacers as they will be the only support for the plane sides which are already loaded with tension, should the wood infill give up some of its moisture and shrink. I have no secrets in my methods. It just takes a lot of dedication to achieve this much work and detail. This is my long awaited A1 14 ½” panel plane. The object in all my planes is to make it better than the ones that preceded it and the standard can only go up. This high standard can be seen from the close up photography and illustrations on this site . 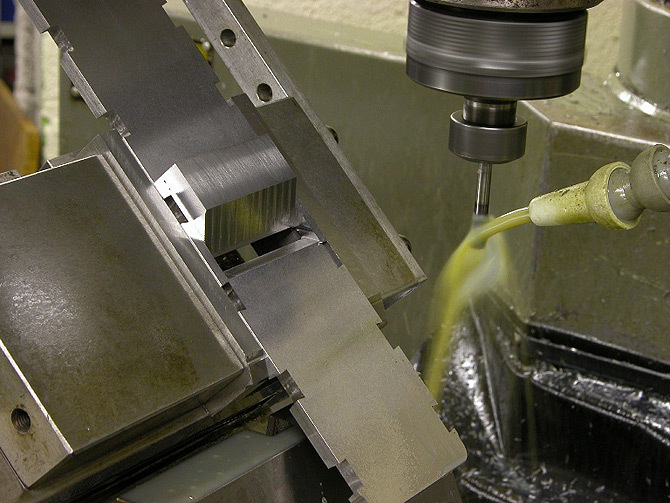 I go to a great deal of effort to achieve this high standard and you won’t find its like in other infill planes. Notice that these sleeves are shown in steel but I usually use brass. The riveting passes through metal sleeves which gives positive support and spacing to the sides (the illustration just gives an image without the wood). Without these spacers there would only be wood which is dimensional unstable which would shrink with moisture loss which is a common situation. The antique planes usually reflect this with the rivets raised.. 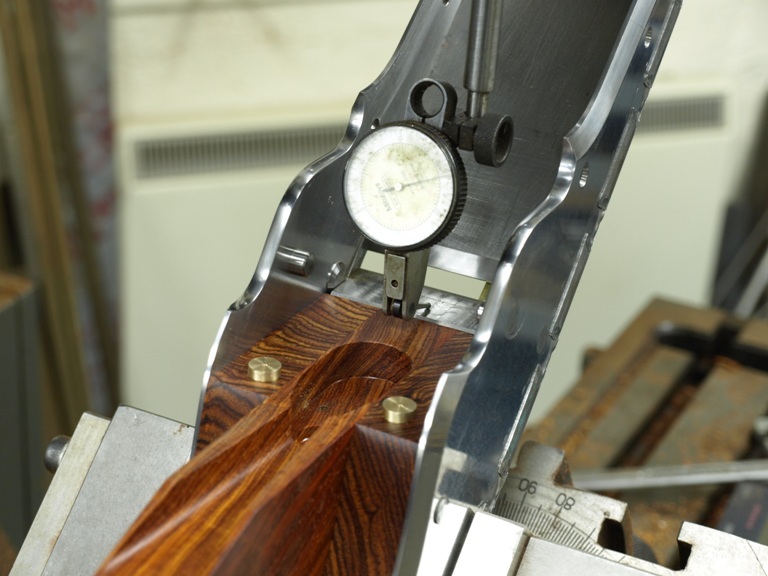 When the wood does shrink and the sides, which are always under tension as a result of the rivet peining, move inwards as this tension is released. 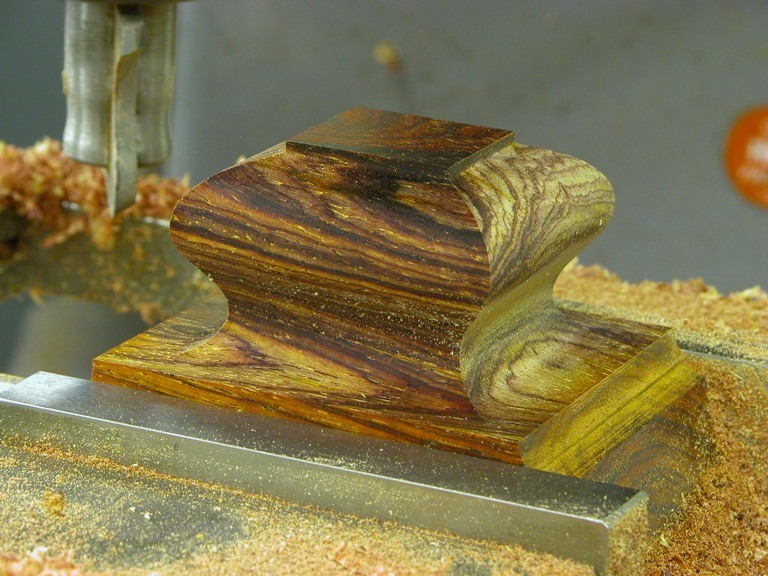 So as the tops of the sides move in, the bottom also flexes and becomes convexed. Of course the opposite effect would be caused by humid conditions, with more moisture present in the wood, the wood will expand, this will push the sides out in my planes and everyone else’s as nothing can hold that force. 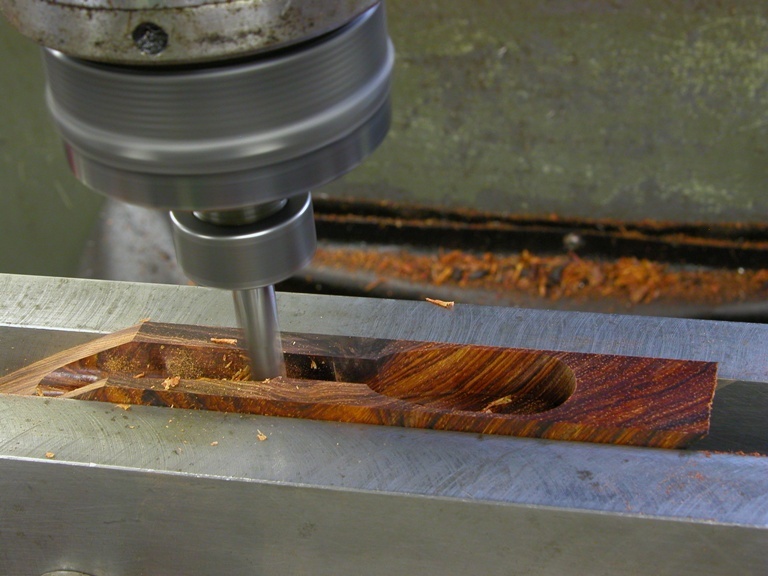 By using these spacers at least I can deal with the shrinkage but it is essential that all wooden infill planes are not exposed to dampness or too much humidity.